This is the first article of sixteen, on the sixteen tarot court cards of Tabula Mundi Tarot. Seems like a weird place to begin, here nearing the end of the year. But the Knight of Wands is the first of the courts, and this is his season. In this series we will deconstruct each of the courts, exploring the elements, signs, and ultimately the decans riding the wheel that make each avatar all it can be. We will explore the 36 decans through the 12 zodiacal signs of the courts Knight(King)/Queen/Prince, and the four elemental signs of the Princesses (Pages). The first is on the very first of the court cards, the Knight of Wands. Fire of Fire, Yod of Yod. The Yod of YHVH is fire, the spark of creation, and here in the first of the four worlds. It is like the very tip of the letter yod, the point from which the rest of the circle springs. This is the story of the Archer and Hermes, and the Archer and the Moon, and it has as a shadow story Death and Demeter, foreshadowing what is next as well as what is behind. The Knight of Wands. Why is he such a yod? Christmas is the Devil. It really is! What does this have to do with the Knight of Wands? Well, he, and the Queen of Disks, actually have something in common, which is Christmas and the Devil. Though Christmas Day falls in the sign of Capricorn, “the devil is in the details” as they say, and all that makes it so is foreshadowed in Sagittarius season. About November 21st, right around the time that people start having to think about the holidays Thanksgiving and Christmas (at least in the USA), the Sun passes into the sign of Sagittarius. The court card that comes to mind as most identified with the sign Sagittarius is the Knight of Wands. He is “Fire of Fire” and so of the fire element doubly; the fire of knighthood, and the fire of Wands, the world of Atziluth. He is the ultra mutable in that he is both the last fire sign and the last of the mutable signs (Pisces in Spring, Gemini in Summer, Virgo in Fall, Sagittarius in Winter). 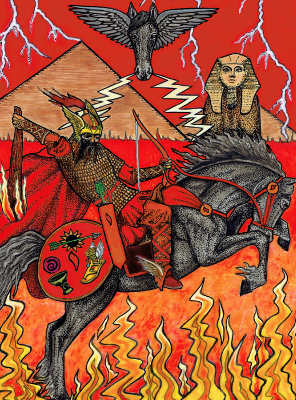 Sagittarius is the Archer, the third sign of the fire set; in the cycle of all the elemental sets through “begin, stabilize, change” it is change, or mutability. Cardinal signs initiate, fixed signs sustain, mutable signs let go for the ride into the next thing. The ship sails forth, the ship anchors, the ship sails away and the cycle begins again. In the wheel of the year, we have the cardinal sign Libra marking the place where summer ends and fall starts, and then the fixed sign Scorpio, as the Sun moves through the fall months of October and November and on into December. When the Sun moves into the mutable sign Sagittarius, we are at the last third of November, a few days from Thanksgiving. 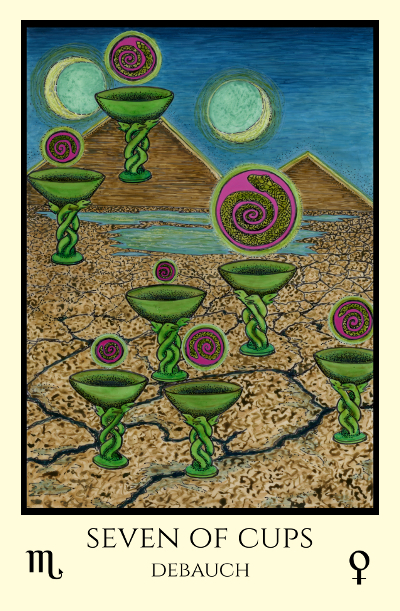 We have recently passed through the last decan of Scorpio with the Seven of Cups and it’s illusionary pleasures, where we envision the feasts to come. 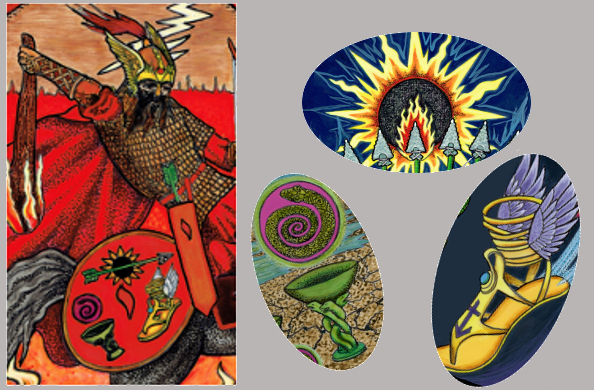 Interesting that often that Seven of Cups (Debauch) comes up in association with the “after effects” of partying too hard, but in the wheel of the year it seems to be right before the party-hard season. This is the shadow side of the Knight of Wands, those fantasies that seem to go with dreaming big. Death and the Empress; Aphrodite goes Goth but it really doesn’t suit her. Around November 21 the sun moves into the first decan of Sagittarius; time to look away from the will-o-the wisp. Party on dude, hurry up and catch that light wave, here comes Sagittarius. The Archer and Hermes make for a straight shot of pure speed. 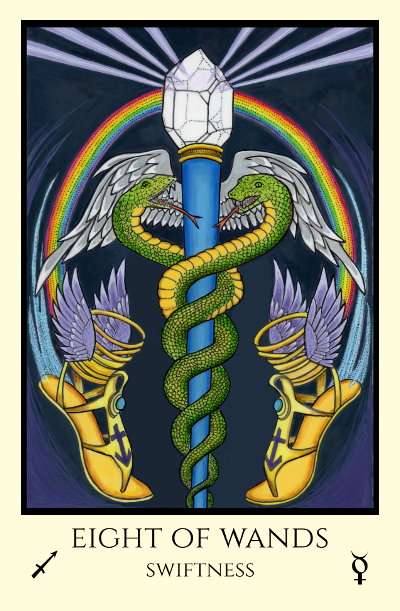 The Eight of Wands, Swiftness. Swiftness? Thanksgiving, with the great big sleep inducing feast? Well, yes. From here on in we rush headlong into the end of the year, with all of the hyper speed of the holidays somehow taking up time. The year is running out. We meet up with friends and family and communicate, sometimes the dual bookends of Thanksgiving or Christmas are when you see people you don’t often see, until the next year. It’s the time of “Black Friday”, or now it is more accurately “Cyber month” shopping, when people are inclined or compelled or outright forced to shop, unless they opt completely out. Certainly your energy is flowing out swiftly and freely, if you are socializing, or shopping. Even if one manages to dodge those things, here in the north it is the time of approaching winter. If you live in a colder northern climate especially, you will know how fast winter arrives. Time moves fast, and it sure is mercurial and elusive. It’s still “fall” technically speaking until December 21st, but the heavy coats and shoes have come out and been in rotation. You’d better get out there and trim back the giant vine that is overtaking your house, and pick up the garden tools, and tarps, and chairs, and random weird things out in the yard before they get buried in feet of snow and ice until April/ Or May. You don’t want to pick things up, or you do want to but you get busy, or both are true, and before you know it winter really feels like it is about to happen ANY SECOND NOW. You’ll probably be communicating a lot, and if you are observant, you may even pick up a genius idea, either from some outside contact or more likely, from the inner genius just picking something up on the airwaves in reverie. If you don’t pay attention and grab that thought though, it passes on by swiftly. 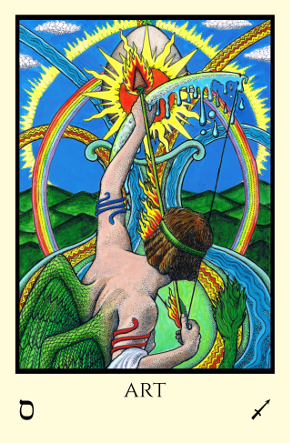 Following Swiftness, the 8 of Wands, we move into December, what most people think of as the month of Sagittarius, though it only has two of its decans. The beginning of December is the season of the 9 of Wands, Lord of Established Strength. The Archer and the Moon; Art in the pure flow of the Priestess. At the start of December we have moved into the middle decan of Sagittarius. Strength comes from flexibility. It helps to go with the flow, and not get rigid. The sap descends, but know that descent is in preparation to rise again renewed. In the north, it starts to really feel like winter. Often the first snow falls that is enough to cover the ground. These ten days contain the birthday of St. Nicholas, December 6th. God forbid you have a birthday now, or you are doomed to a lifetime of no cultural events except for “holiday craft fairs” and renditions of the Nutcracker suite and its ilk ever falling on your birthday. Good ol’ St. Nick. Is “St. Nick” the Christian saint, giver of gifts and protector of those in need? Or is St. Nick Santa Claus, giver of gifts to good children, or is St. Nick old Nick the Devil, Satan, the giver of the knowledge of good and evil? “Nick” is also one of the names of the devil, won’t you guess his name? The devil is in the details, and dyslexic devil worshippers worship Santa. It is actually not the worst time of year. This is when picturesque flakes of snow fly here; usually they are the kind that look “pretty” covering the tree branches and the ground for a day, then disappear. We are not yet lodged in our bunkers; we are moving. If you were not aware of the approach of Christmas before, chances are it is noticeable now. It’s the next big thing in the cycle of the year before New Year’s Eve, even though we still have the last decan of Sagittarius to bear. 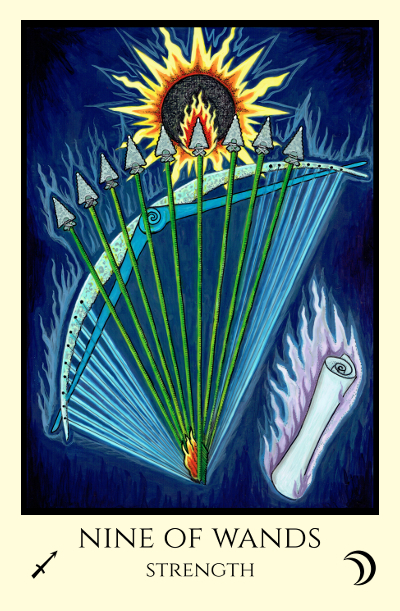 In the last decan of Sagittarius, we meet the 10 of Wands, otherwise known as the Lord of Oppression. Past the fast flare of the Knight of Wands, we slam right into the reality of the Queen of Disks. It is a really difficult time of year she begins at. There is all the stress of the approaching holiday baggage and we are also approaching the darkest day of the year, the winter solstice at the end of the decan. 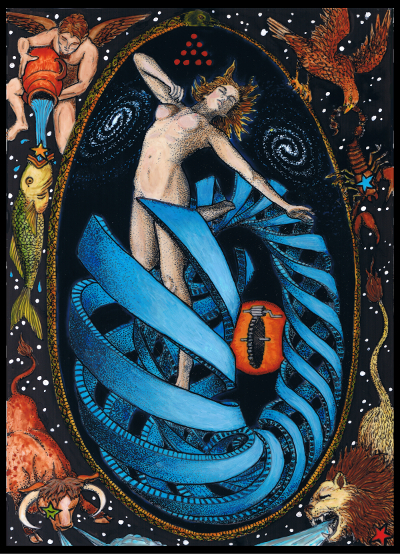 While Sagittarius in sign, the 10 of Wands is the first of the decans of the Queen of Disks, who is usually associated with the approaching sign of Capricorn. She has though the last decan of Sagittarius as her shadow, her blind spot or where she retreats in times of stress. Christmas day falls in the first decan of Capricorn, the middle decan of the queen and the sign we normally associate with the Queen of Disks. Capricorn, whose major arcana card is the Devil. That decan starts around Yule, December 21st, the darkest day of the year, and also the slow beginning of the climb towards light. But that is for next time. For now, we are here in the season of the fire knight, the rush of activity just before the hibernation and recuperation of winter. This will all be over before you know it, when reality kicks in and we can hunker down. But for now, we hurtle onward towards the penultimate marker of the year. So back to the Knight of Wands. He, like all of the court cards we will encounter in this journey through the courts, shows visually in his depiction these three decans. In this card, he has the shield with emblems of the Seven of Cups, Debauch; Eight of Wands, Swiftness; and Nine of Wands, Strength. He takes us through mid November (last decan of Scorpio) through mid December (middle decan of Sagittarius). We are propelled by desire (7 of Cups, Venus/Scorpio), rushing swiftly (8 of Wands, Mercury/ Sagittarius) towards the darkness before the return of light (9 of Wands, Moon/Sagittarius). We have to remember, this Knight of Wands card is the spark, the whole start of the cycle of the fairy tale of creation. All Knights are a beginning impulse. In his case, the arrow is shot and the target is the power to Will. All he does is toward that eventual end. Next up, the last decan of Sagittarius, the shadow card of the Queen of Disks, our next court card in the series. It is the final slog until the light begins to increase again and we get to the Christmas holiday, Devil season, so that we can be through it and onward to the change of the year, when we can build anew.